Aviana Resortis an exclusiveprivate destination conveniently located inSouthwest Orlandowithin 10 miles of the Walt Disney World entrance. This resort offers a unique vacation experience that includes delightful amenities and stunning tropical landscaping fromthe comfort of your ownbeautifulprivatevilla. The resorts amenities include swimming pool, spa, fitness center, business center, sand volleyball, children's playground and putting green. Escape to what has beencalled anamazing destination for the whole family with an experience like no other. 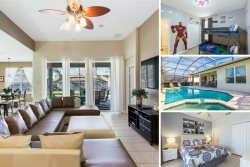 Our quiet all inclusive family resorts is located in the in the Orlando area, just a short driving distance from the radiant beaches of Tampa, to all the theme parks your family could dream of. Here, your family can relax in a gated community specifically designed to have the comforts of home but the luxury amenitiesof a resort.